Be the first to hear about their new releases and deals. 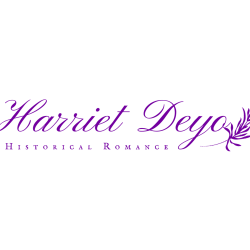 Download the Booksprout app and search for Harriet Deyo today! Harriet Deyo has loved Regency romances for as long as she can remember. When she was much younger, she would "borrow" her mother's romance novels and read them under the covers with a flashlight! In college, she wrote her thesis on Jane Austen, all the while dreaming of becoming an author herself. When she did start writing Regency romances, it felt like the most natural thing in the world! Now, Harriet lives in sunny Southern California with her tenacious cat, Cara. When she isn't reading or writing, she enjoys tending to her English rose garden.